Peek-a-Baby by Karen Katz has all of the elements my baby loves to see in children’s books. 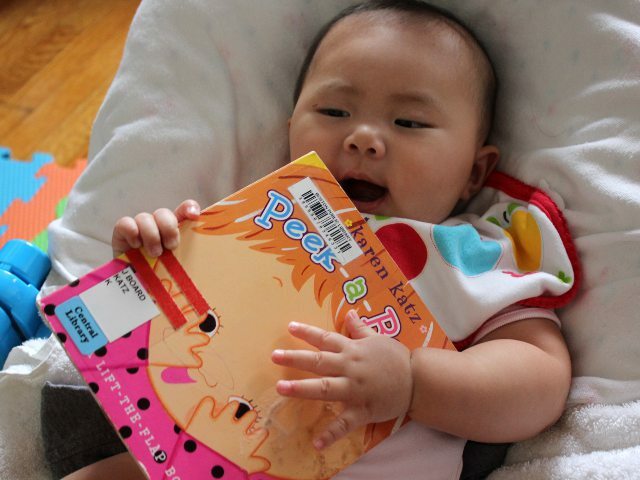 With pictures of wide-eyed babies to attract her attention, colorful backgrounds to keep her interest, and the lift-the-flap feature to give her something to play with, Peek-a-Baby has been one of Arya’s favorite books thus far. My daughter loved staring at the baby on the front cover. For the past month peek-a-boo has been one of Arya’s favorite games. The picture of the baby’s eyes peeking out from her hands reminded my baby of playing peek-a-boo with us. Inside the book, six additional babies hide behind flaps. The flaps themselves are brightly colored objects: umbrella, shorts, beach ball, hat, curtain, and teddy bear. Each baby is unique with different clothing, hair style, and facial expression. Like all lift-the-flap books, the pictures of the babies’ faces under the flaps are more interesting than the images with the flaps down. After she figured out she could move the flaps, Arya loved the book and wouldn’t stop playing with the different flaps. Unfortunately, the copy of Peek-a-Baby that we read was old and the glue securing the flaps had loosened enough that one flap fell off. A few dabs of paper glue was enough to re-secure the flap, but parents should supervise young babies to prevent them from ripping off and eating the flaps. Every page has the words “peek-a-boo” making the book even more like the fun children’s game. Young readers will love playing peek-a-boo with the babies in the book. Babies and toddlers will love having adults show them how to play peek-a-boo using the flaps. Peek-a-Baby is a terrific book for babies and toddlers. Even older, school-age children will enjoy playing with the book by themselves. The book is particularly good for children who have just learned how to play peek-a-boo. Peek-a-Baby costs (including shipping) under $7 new and under $5 used from Amazon.